Offering over a hundred USB3 Vision camera models, Machine Vision Store likely has the camera you need. Certainly contact us for help choosing the best camera for your project. Defines the computer-to-camera communication protocol. Draws from the GenICam standard, which is the common programming interface for all modern machine vision interfaces. When should I use USB3 Vision cameras? Offers bandwidth sufficient for high resolution images to be transferred at higher frame rates. Maximum bandwidth is about 350 MB/s, which exceeds both GigE Vision (assuming a single link at gigabit speed) and Camera Link Base. Builds on the ubiquitous USB standard to drive down component costs. No expensive frame grabber is needed. If your computer will be located near the camera, USB3 Vision is the leading candidate. But if you need a long cable length, consider one of our GigE Vision cameras. Note we also offer active USB3 cables up to 100 meters in length, for when you need both cable length and a greater bandwidth. What's the difference between USB 3.0 and USB3 Vision? Universal Serial Bus (USB) is an open standard originally developed in 1994. It defines the cables, connectors and communication protocols used in a bus for connection, communication and power between electronic devices. With the advent of version 3.0 with "SuperSpeed", this bus now has more than enough bandwidth for typical machine vision projects. 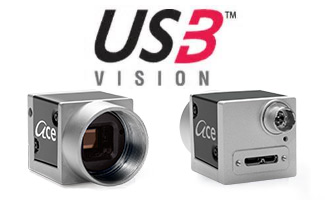 The USB3 Vision standard blends together USB with the GenICam standard. GenICam defines a generic programming interface common to GigE Vision, Camera Link, and some Firewire cameras. Software developers can therefore write code that communicates with any USB3 Vision camera, without paying much attention to which camera model is connected at the other end of the cable. Because of this standard, companies can create near universal drivers for all USB3 Vision cameras. And these drivers can be much the same as drivers for GigE Vision, Camera Link, and Firewire cameras. One word of caution. There are some companies selling cameras that are USB 3.0 compliant, but are not USB3 Vision compliant. To use these cameras, you must use proprietary software. If you develop software around such a camera's API, your software may be of little use if you change to a different camera manufacturer in the future. How does USB3 Vision compare to Firewire? Like Firewire, USB3 Vision offers efficient image transfer to host memory. And, like Firewire, cable lengths are limited. Here's Basler's white paper comparing USB3 Vision with Firewire. How can I ensure my system will handle the camera's data load? We occasionally hear from customers having problems achieving a camera's maximum frame rate. Images may be dropped. Or, even worse, communication with the camera may stop, necessitating cycling power to the computer and camera. This is most common with high-resolution and high-frame-rate cameras that need to transfer more than around 200 MB/s. We always recommend using a high-quality shielded USB cable. Even shielded cables over five meters in length may have problems in electrically noisy environments. In such cases, we recommend one of our fiber-optic extenders. The most common problem is the computer's USB controller. Many controllers fail to handle anywhere near the data load specified by USB 3.0, even though they are marketed as USB 3.0 devices. Basler's white paper provides some rather disconcerting test results. This issue is typical of the USB controllers built in to many computers today, especially notebooks and embedded computers. To avoid this problem, see our USB 3.0 PCIe cards that have been tested under full data load. Furthermore, most computers and USB cards have multiple ports connected to a single USB controller, requiring a camera to share bandwidth with other devices. Some of our USB cards have a USB controller dedicated to each port so that each camera receives the full bandwidth, without interference from other devices. And finally, the problem may be the computer itself. Not all computers are created equal. Some just are not up to the task, especially when multiple cameras are grabbing simultaneously. For your convenience, we offer several industrial computers designed especially for imaging. Where can I learn more about USB3 Vision? You may like to read USB 3.0 Interface and USB3 Vision Standard — Data, Facts, Setup and Migrating to USB 3.0, and Setting Up a Stable USB3 Camera System. Also, this white paper does a nice job comparing the various camera interfaces.